Being a teaching librarian comes with its unique set of challenges. We are constantly up against the challenge of being akin to a perpetual substitute teacher; no matter how integrated our library teaching curriculums might be at our institutions, we typically see students in a “one-shot” format. We don’t have the benefit of building relationships with students in the same way full-time teachers and faculty are able to do over the course of a semester. Because of this, we are asked to construct—from scratch!—a captivating classroom atmosphere that’s ripe for learning every time we assume the role of teaching librarian. On top of that, most of us haven’t been trained as teachers or educators while pursuing or working in librarianship. But even in the teaching world, the performance aspect of teaching is often neglected during the education and training process. The parallels between teaching and acting are the reasons why one of the best things I’ve done for my teaching has been taking an acting class. It’s true! I had an epiphany when I realized that teaching was just performing in front of a student audience. What began as an uncertain adventure into an unknown discipline became a learning experience that completely transformed how I think about myself as a teaching librarian. One of the key aspects of this transformation was GOTE, an acronym and acting theory developed by Robert Cohen, author of Acting One, one of the most popular textbooks for beginning acting classes. The GOTE system offers actors a framework for gaining an awareness of their characters by going beyond a basic understanding and developing a deeper knowledge around the motivations that determine the character’s actions. Finding a character’s GOTE by thinking about its different facets can help an actor to better personify the character they are portraying; the same can be said for helping us as teaching librarians better understanding our roles in the classroom. The G in GOTE stands for “Goal.” This refers to the character’s primary objective, and is what ultimately serves as the motivation that drives the character’s actions. To determine a character’s Goal, an actor asks how the character would respond to the following prompt: “I want _____________.” Just fill in the blank. Take Dorothy in The Wizard of Oz, for instance. All throughout the film, she makes it clear—through both words and actions—that what she really wants is to go home. Similarly, we as teaching librarians have Goals in mind whenever we enter the classroom. Those learning outcomes we spend hours crafting are a primary example of these. We can have more personal Goals as well. For example, “I want to be able to foster dynamic discussion,” or, “I want to get out from behind the lectern and walk around the room during my lesson.” These Goals are specific and vigorously pursued until the end of the class, just as a character pursues their Goals until the end of the film. 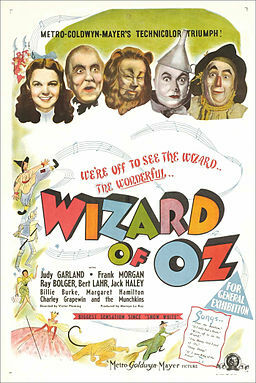 Image Credit: Wizard of oz movie poster by MGM. CC0. In front of any goal is an “Obstacle,” or series of obstacles, the O in GOTE. Obstacles are whatever stands in the way of the character getting what they want. Often this is a person, or an “Other,” someone with conflicting goals who acts in direct opposition to the character. Let’s consider Dorothy again. What stands in the way of her returning home? For one thing, she has a long journey ahead of her in an unknown and mysterious land. She also has the Wicked Witch of the West to contend with, an oppositional Other whose own goals include wanting to steal the ruby red slippers and exacting revenge on Dorothy. Not to mention Glinda, who keeps the secret of the ruby red slippers to herself and doesn’t let Dorothy know that they’re her ticket home until the very end of the film. As teaching librarians, we have many Obstacles to contend with in the classroom. Students don’t necessarily share our goals for facilitating or participating in a successful class. Sometimes, they’re more interested in catching up on sleep or checking the latest Facebook updates. Other Obstacles may be more personal or circumstantial, such as a fear of public speaking, or teaching from an unfamiliar lesson plan. In either case, Obstacles are the challenges a character needs to overcome in order to achieve success. To maneuver around these obstacles, characters employ Tactics, the T in GOTE. Tactics reside on a spectrum between two extremes: Charm Tactics and Threat Tactics. Charm tactics include the nice things characters do to get their way, like inspiring, consoling, or encouraging an Other. Threat tactics, on the other hand, can be intimidating, repelling, or acting aggressively toward an Other. Dorothy uses charm Tactics to gain protection from the Wicked Witch of the West by inviting newfound friends to join her on her journey to Oz and inspiring them to achieve their own pursuits. By contrast, the Wicked Witch of the West chooses a more menacing approach, verbally threatening Dorothy at every opportunity and creating perils at every turn along the Yellow Brick Road. As teaching librarians, we are negotiating appropriate forms of these Tactics to manage our classrooms all of the time. We encourage students to participate, and praise them when they’ve said something thoughtful. If one Tactic doesn’t give us the desired results, we try something else; for example, if we want students to engage in dialogue, but the class isn’t especially talkative, maybe we ask them to write their thoughts down on pieces of paper instead. What the concept of Tactics does is it asks us to consider these possible approaches before we even take on our roles as teaching librarians in the classroom. Perhaps the most important part of this equation is the “E” in GOTE. “E” stands for “Expectation.” This speaks to the confidence the character has in achieving their goal, assuming that a character would not pursue a goal that they did not think they could actually achieve. Even in the face of potential failure, a character carries the enthusiastic Expectation of success. It is this “eager portrayal of the character’s expectations and his or her consequent efforts to bring these expectations to fulfillment” that brings a character to life (Cohen, 1992, p. 49). Thinking back to Dorothy again, at what point during the film is the audience ever given the impression that she will never achieve her goal of getting home? Even as the Wizard flies off in his balloon, leaving her stranded, Dorothy and her friends are already trying to devise a new Tactic to get her back to Kansas. We see this in characters whose goals don’t come to fruition as well. The Wicked Witch of the West meets a bitter end, but thinks she has the upper hand until the moment when Dorothy spills the water on her and she begins to melt. No matter the outcome, characters pursue their goals with the positive Expectation that things will turn out as they hope. This, in my opinion, is critical when it comes to teaching. As teaching librarians playing the role of “perpetual substitute teacher,” it’s easy to assume the worst when venturing into a new classroom, whether that be students who won’t engage with us, or forgetting our lesson plan halfway through the class. These negative Expectations interrupt the positive environment that we are trying to create in the classroom. To be more effective performers—and, therefore, more effective teachers—we need to come into the classroom with the positive Expectation that we will deliver a successful class, even if that isn’t how things end up turning out. Applying GOTE to your role as a teaching librarian can help you realize your classroom intentions, goals, and motivations, which will ultimately help you be more confident, and therefore more connected, when engaging with your students. One way to do this is to spend some time thinking about your teaching librarian-self. Start by thinking about or listing your personal Goals as a teaching librarian, and connect those to the learning outcomes you’ve developed for different lesson plans. What are some of the Obstacles that you have to contend with when you’re in the classroom? Are there any that really give you pause or make you “break character”? (Mine is students having side conversations—this always really throws me off my groove!) How might you tackle those Obstacles when you’re in the classroom? Think about the different types of Tactics that you can employ to overcome a situation, and what type of Tactic you might switch to if the first one doesn’t do the trick. Finally, for the best classroom experience, always remember to set your positive Expectation for reaching your now well-defined classroom Goals. A moment of physical release—shaking your arms, legs, hands..
What terrifies you about the situation of the scene? What’s the worst thing that can happen to your character? What excites you about the situation of the scene? What’s the best thing that can happen to your character? This is just one example of what your performance preparation might look like. Maybe you prefer to meditate, take a short walk outside, or do some verbal exercises to warm up. The idea is to give yourself time to get into the appropriate frame of mind for addressing your new classroom audience. Try it, and see if it helps you to focus when you’re in the classroom. For many of us, our roles as librarian and teacher have become intrinsically linked. Taking the time to consider and conceptualize our Goals and Expectations as teachers can have a positive impact on the connections we make to students when we’re in the classroom. This is just one example of the many theoretical, yet practical, examples from theater that demonstrates how learning to become better performers can help us be better teaching librarians.